I'd heard good things about La Antioquena from some coworkers recently--it's close to work--and so I decided to check it out myself. It is a good find! La Antioquena specializes in Columbian food and is decorated appropriately. It's not a fancy place nor a large place--small actually--but good food is good food, and they sure can cook and produce good food, as I found out! My coworker Joe and I decided to visit based on the recommendations of some others. We went on a Friday right about lunch time. As we entered the person behind the counter was busy on the phone, so we seated ourselves. There are probably less than a dozen tables here, but there is also a bar type area in the front where several people were already eating. A few of the other tables were taken. And during our time there, we noticed that they seem to do a good take-out business. The phone kept ringing and orders were being taken. One annoying thing--there is a loud chime that goes off when the front door is opened. It got to be annoying, I'd suggest they turn it off during busy times, or find something less annoying to patrons. In short order we were greeted by the waitress, menus produced, and drink orders taken. 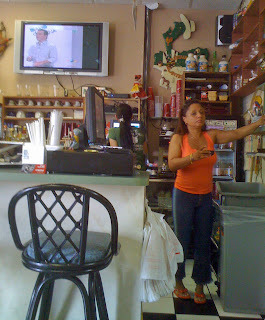 They have a nice menu, in english and spanish, and the prices are reasonable. We found the portions to be generous as well. For a started I asked for and received an empanada--it was very good. The tasty meat and potato filling had a nice pastry crust around it. It was served with a relish of some sort that was absolutely delicious. Little bits of onion, pickled jalapenos, and more were in a vinegar based sauce. I liked it a lot. 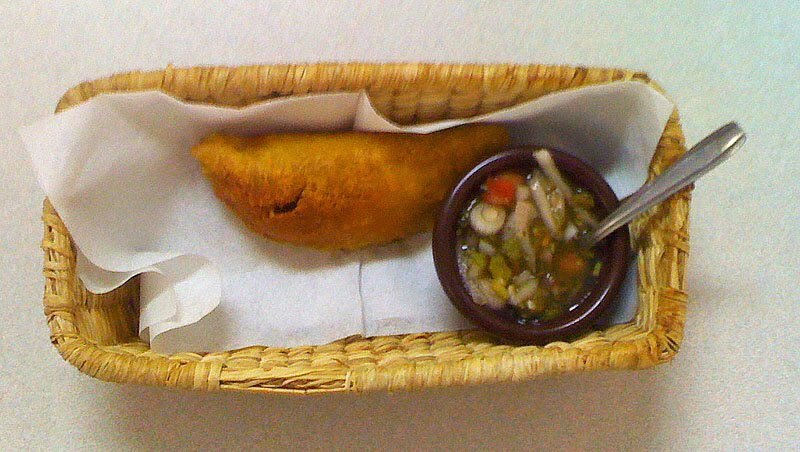 The empanada was also relatively inexpensive, $1.25 i believe. It was good! For lunch both Joe and I ordered the Friday lunch special, Skirt Steak for $8.99. A good sized piece of steak had been grilled and was served over a bed of rice. It was accompanied by a delicious homemade Chicken soup, potato salad, and sweet plantains. On the side was a chimichurri sauce. The chimichurri sauce was excellent, filled with the taste of cilantro and garlic, complimented by a bit of acid (vinegar I imagine) and olive oil. It was excellent. My steak was very good though could have been cooked just a bit less. My only complaint was that my knife was dull, so it was hard to cut the steak against the grain. But it was worth it. Every bite was full of a nice beef flavor. The potato salad was a bit different, slightly sweet, but was OK. And of course the plantains were wonderful, i loved their sweetness. I have no complaints at all about the food, and Joe agreed, it was very good--and our service was good and attentive, too. Likewise the portions were great, so this was a value meal for sure. In looking over the menu, I liked the lunch specials I saw, especially for Thursday and Tuesday. It's close to work, so I suspect I'll be back soon for lunch, and I'd love to try dinner here too sometime. I nice find. I love it! 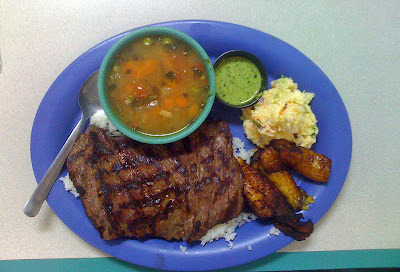 I've never had Columbian food before, but if this is representative of what it is like, then I love Columbian food. Yumm! For Easter this year we had a real treat, my friend Ewa made żurek, also known as Polish Easter Soup, and sometimes called white barszcz. It's basically a thin white soup and uses a sour rye started as a base, with polish sausage and hard boiled eggs in it, among other things. At first thought, you may think to yourself "this does not sound that good." But let me tell you from experience, when done right it's wonderful, and my friend Ewa did it to perfection. It was so good that one of my friends who's not very adventurous in the food department and more of a "meat and potatoes" type of guy, after he tried a taste, he had a whole bowl, and then came back for seconds. Yes, it was that good. That's it! That's all their is to it. Now you have Ewa's secret and can make a żurek nearly as good as hers! Bardzo smaczne! 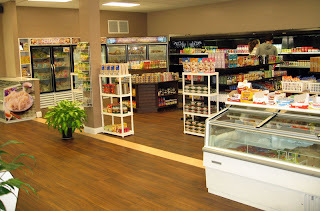 Wow, for a little place, a lot of flavor is packed into International Market and Deli. I'd read about this place in another Orlando area food blog, Tasty Chomps! I'm sure glad he passed the info along. So on a recent rainy Sunday afternoon, a friend and I set out for this place. We were not at all disappointed. We actually had some very good eats here for an astonishingly low price. 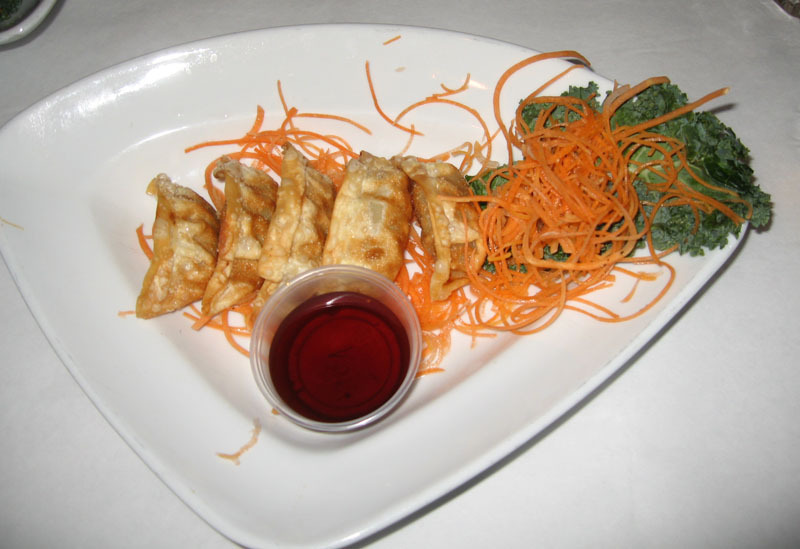 Located conveniently to downtown Orlando in the Asian area of Mills Street and colonial Drive, International Market and Deli seems to be in a good location, adding a nice nuance to the international flavor of the area. 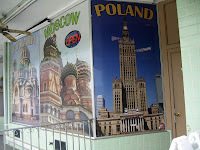 They specialize in food from central and eastern Europe. I'd say their main emphasis is Russian and Ukrainian, but they also have an adequate variety of Polish and other eastern european food such as Romanian, Serbian, and a host of other countries. In many cases, the foods of those areas blend and bleed from one country to another. 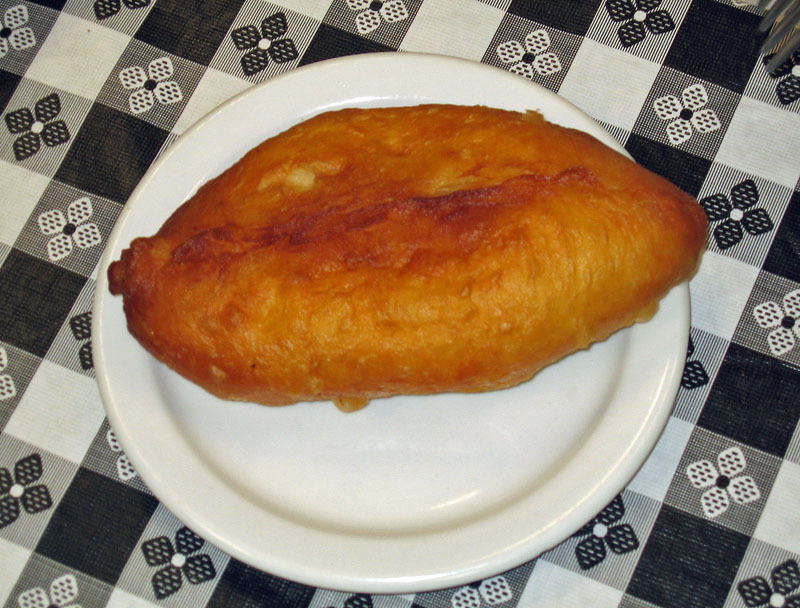 The piroshki of Russia is related to the Varenyki and the Pelmeni of Ukraine which turns into the pierogi of Poland (and eventually into the ravioli of Italy and potstickers of China!). Lots of good food, that's my point. After looking around a bit, we decided to eat. The ready to eat foods in their deli section were not clearly labeled, so we had to ask what all they had, but the proprietor was available and ready to answer all our questions. We sampled and sampled and ate well--for well under $10--for two of us! Amazing food at a fantastic price. 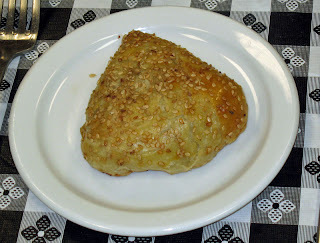 My friend Tommy started with a Russian offering, a piroshki. This is a bread-like stuffed dumpling that is deep fried. His was stuffed with a potato mixture, though they also had cabbage/mushrooms and meat fillings available. 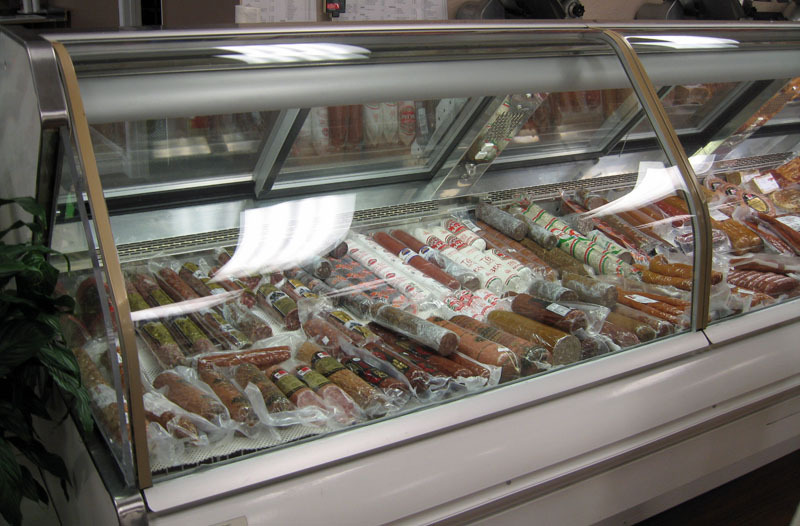 By the way, the foods are chilled in the deli case. If you want to eat there, they microwave them for you--the same thing I'd do with them if I took them home. 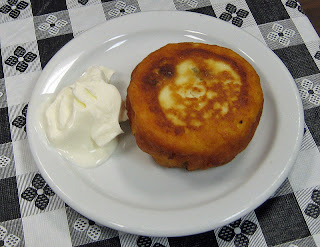 For my first try, I ordered something whose name now escapes me, I believe it's a Serbian food. But basically it's a pastry dough/dumpling that was stuffed with a mixture of ground lamb and onion, and topped with some sesame seeds. I'm guessing it was originally baked. But, it was fantastic. Wow, what a lot of flavor there was in there. I was truly outstanding in flavor. I only wish there had been more of it. But then again, there were other things I wanted to taste. For another selection, I had a meat Burek. 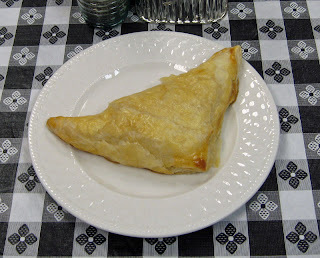 This is basically a pastry made with layers of phyllo dough and stuffed with a meat filling. It's thought to have originated in Turkey originally, but is a dish from southern central europe, areas like Bosnia and Serbia, for example. Not content with only my cheese burke, I also ordered one stuffed with cheese. Oh my! That was soooo good. I have had cheese bureks before and this was as good as any of them. Truly a good (but very rich) dish. Tommy ordered a cheesecake dish of some sort. It was round and patty-like, but definitely a cheesecake consistency with golden raisins. It had a great mild cheesy flavor and the raisins gave it a nice texture and taste. It was served with a dollop of sour cream that served to enhance the rich flavor of this cheesecake. Another hit. Of course, we didn't just eat here, we also perused the selection--though when we first got here, eating was the number one thing on our agenda and we were grateful for the small (two tables) eating area they have set up near the deli case. The tables are set up right off the deli case, and in the general area of some beverages and, of course candies. Oh, so tempting. And yes, we did give in to tempation. 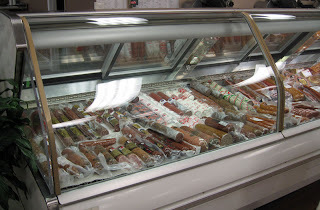 There is a large meat case that is packed with various meats and sausages. Some can be sliced to order, too. Near that is a big frozen food case. Next time I'm coming with my cooler--I spied many varieties of pelmeni (think small pierogi). I'd love to stock up. There was a also a cooler section with a large variety of foods, everything from herring to other fishes, vacuum packed and ready to take home. 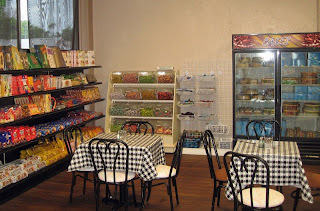 There is also an extensive selection of canned, jarred, and packaged goods, all sort of wonderful items. This place is a very welcome addition to the Orlando area food market. Situated near the Asian ethnic food area, and located right next to a shop that sells mainly British items, International Market & Deli seems to have a great combination and selection of food items. I hope Orlando take heed and shops here and at all the other great ethnic markets we have in the area. Across the street from here is an Asian market. Up the road a piece in Winter Park (Aloma and 436) is Polonia, the Polish store. There are a number of great places around. Ample area to explor some new culinary adventures! 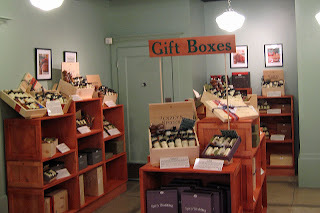 I have long been a fan of Penzey's Spices, a growing retail and online spice purveyor based in my hometown of Milwaukee. Until now, I've been relegated to ordering online occasionally, or returning from a visit "home" with a bunch of spices packed into my suitcase. Imagine my surprise a month or so ago when I learned that they were going to open a store in Winter Park, Florida--about 15 miles from me. I was absolutely ecstatic! I was overjoyed last Saturday when my friend Creighton called and told me he heard they had opened. I could not believe it. So, I did the normal thing and checked their web site--sure enough, the Winter Park location was marked as open. The very next day, I took a road trip to Winter Park to "tour" this new Penzey's location. I was not at all disappointed. The locations I've been in before all have somewhat the same logical layout. We entered and immediately perused the seasonings section. 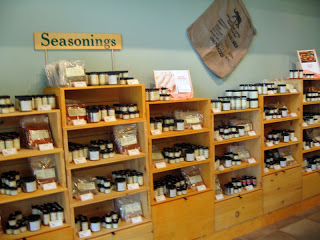 What makes this such and outstanding place for spice and seasoning shopping are the "sniff jars" (my term). On each shelf of spices, there is a large jar with a lid and you can simply unscrew it to sniff or smell that particular offereing. Brilliant! It really give you, the shopper, a great chance to know exactly what it is you're buying, at least by the smell (and the whole place smells just wonderful, as you can imagine. Penzey's does not just contain the few run-of-the-mill seasonings and spices you'd find at your local grocery or the local mega-mart, they have a lot more, and all are very fresh. Where else can you find maybe four different varieties of cinnamon? Or find whole, powdered, and coarse-ground mustard seeds--in several varieties such as yellow, brown, and black? Besides just plain spices and seasonings, Penzey's also comes up with their own concoctions. Each is plainly labeled with the ingredients as well as their suggestion of what it's really for. One of my favorites is Brady Street Sprinkle, containing cheese, onion, garlic salt, parsley, and a few other things--I love to sprinkle it on peas, among other things. On my recent visit, I bought some Chicago steak seasoning and I tried it out that night on some steak--it was awesome! Many of their house blends are named after various neighborhoods in Milwaukee, too. And in their gift box area, you can buy give boxes of various combinations of spices, seasonings, and house mixes. I believe you can also make up your own. 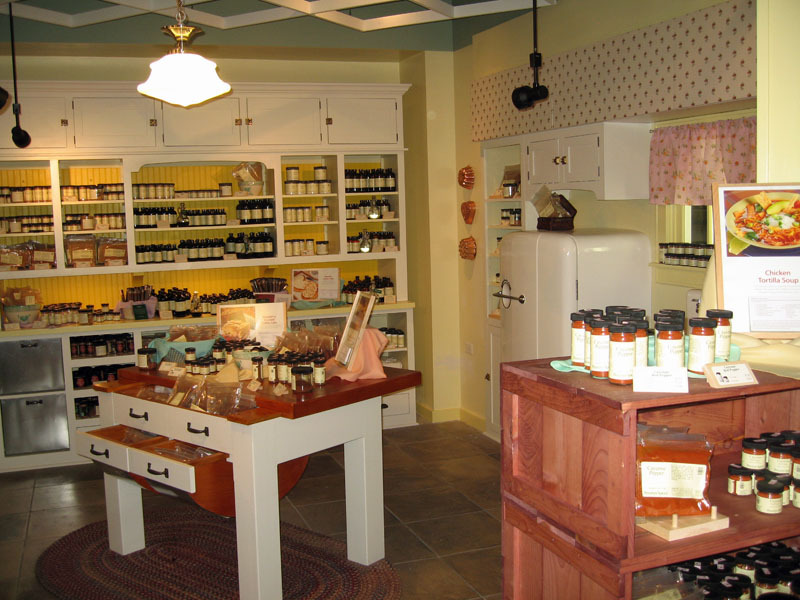 Of course baking spices are a really popular section, and probably the best smelling area of the store. 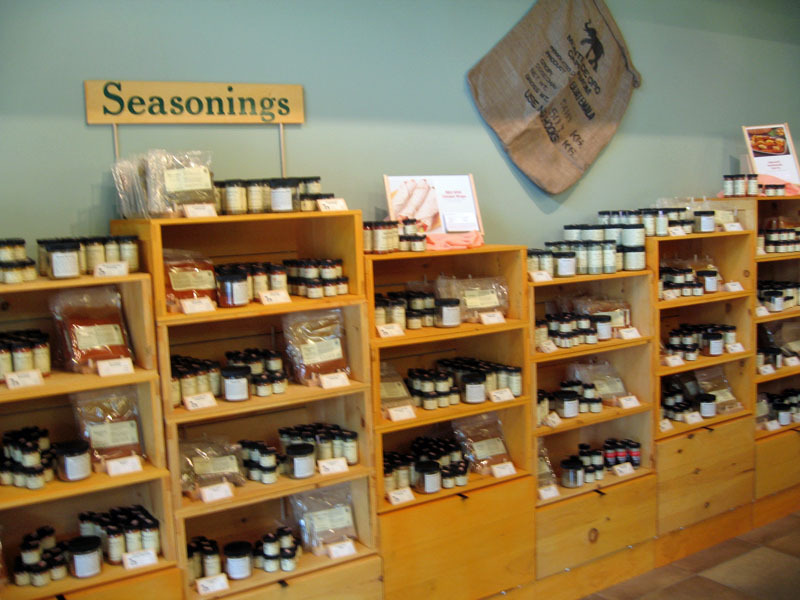 Cinnamon, cloves, allspice, ginger, nutmeg, and a wide variety of other spices are all availalble here. I know I'll be going here before the holidays to stock up on my favorites. Their spices and seasonings all come in several sized, from small and medium (grocery store size) jars to bulk packages--there's a size for everyone and every need. Each type is clearly marked with the prices. If you have some old spice jars at home and some friends, consider pooling your resources and get a bulk size, you can save a bundle! But no matter how you cut it, this is THE place to go for fresh spices and seasonings at a resonable price and with a fantastice selection. I know I'll be a frequent visitor here. 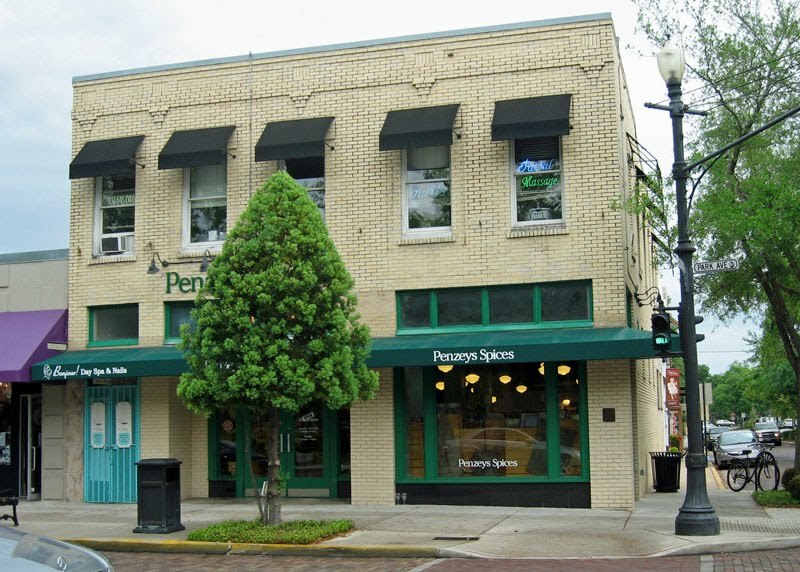 If you like to cook like I do, do yourself a favor and stop in at Penzey's and try using some really fresh spices and seasonings--not those things from the mega-mart that have dust on the tops and have been sitting there for years. Trust me, you'll be glad you went "fresh!" 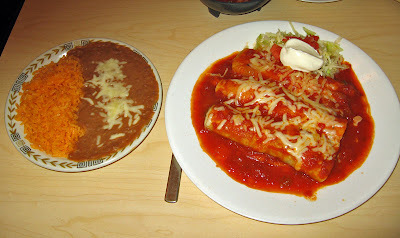 Unfortunately, Mestizas Restaurant did not live up to the hype. It was not bad, but based on the urbanspoon.com reviews, I was expecting something way above what I got. Had those reviews been representative of what I experienced on my recent visit there, I'd have loved this place. As it was, it was OK food, some high points, some low points. However, I would say it was a value. That is, the prices are very reasonalbe, and i think I would like this a lot more as a lunch place, a place to grab a reasonably priced meal at a good price. For dinner, it just fell a little short. To begin with, I was a bit confused. We arrived around 7 on a Friday night and were promptly greeted, told we could seat ourselves, and had our drink order taken in prompt manner. While perusing the menu, we saw chips and salsa listed as an appetizer. We were going to order that, but our waitress arrived with chips and salsa. Perhpas they are complimentary at dinner time? I don't know, I just was a bit confused. However, the chips were fresh, fresh, fresh. The first few I had were actually on the hot side, obviously fresh out of the fryer and very good. I will say that the pile of chips was a bit unevenly salted, some on top were a bit salty, those on the bottom under-salted. But they were good, as was the salsam though I would have preferred a bit more heat. 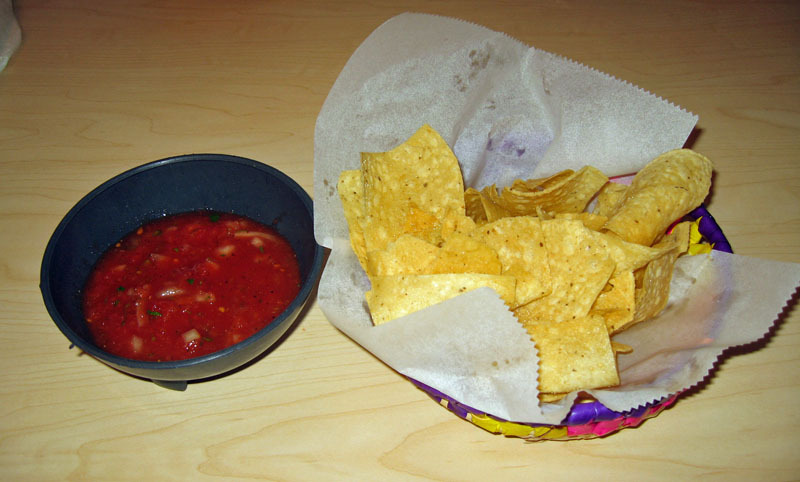 But it was tasty with a nice, fresh tomato flavor with a hint of lime and a very faint cilantro flavor--very good salsa overall. For an appetizer we ordered the Carnitas de Pollo--deep-fried tips of chicken wiht sauteed onions served over some chopped romaine. My friend Tommy thought the chicken a bit tough or rubbery, but I thought it was pretty good. The onions, however, were a bit tough, and I'm not sure why. They seemed to have been just a bit undercooked and were for the most part locked in that stage between raw and sauteed where they were just "tough." I don't know how else to explain it. But the real star of this dish was the dressing--a lime based light dressing was used and it was indeed outstanding. I actually used a spoon to sip some of it and really, really liked it--a lot. For me the chicken and the dressing were very, very good and I was pleased. For his main course, Tommy ordered the Chimichanga. The menu says it's shredded beef tips wrapped in a flour tortilla, deep fried, and topped with cheese, served with lettuce, tomato, and sour cream. It was also topped with a bit of guacamole and served with refried beans and rice. I did have a bite and it was not bad, quite tasty, actually. 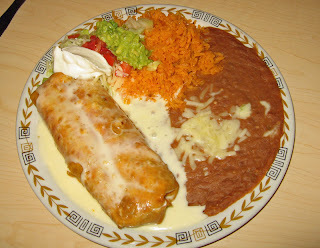 However, the beef was not shredded, it was cubed, and the filling was a bit runny, not the firm filling I'd expect in a chimichanga. It was not bad tasting, it was actually pretty good, just not quite what I expect in a chimi.... Also, the "topped with cheese" was actually a thin cheese sauce, too thin for my liking actually, but it was not my dinner. It was overall OK. I definitely enjoyed my meal here, but I'm not sure that I'd go back for dinner, there is better Mexican food for dinner, I think, in Daytona (La Fiesta and Maria Bonita's definitely). However, I think this would be a great place for a lunch bite if I lived or worked in the area. But again, it did not live up to the hype given in the three reviews I read on urbanspoon.com. Makes me wonder who really wrote those reviews. No matter, it was an acceptable experience, I was just not overwhelmed. The price for our meal, two entrees, and appetizer, and two regular drinks was about $26. Not bad. A value. Just not great. I was in Atlanta recently, and we decided to stop at Your Dekalb Farmer's Market. It was a fun spot to visit. 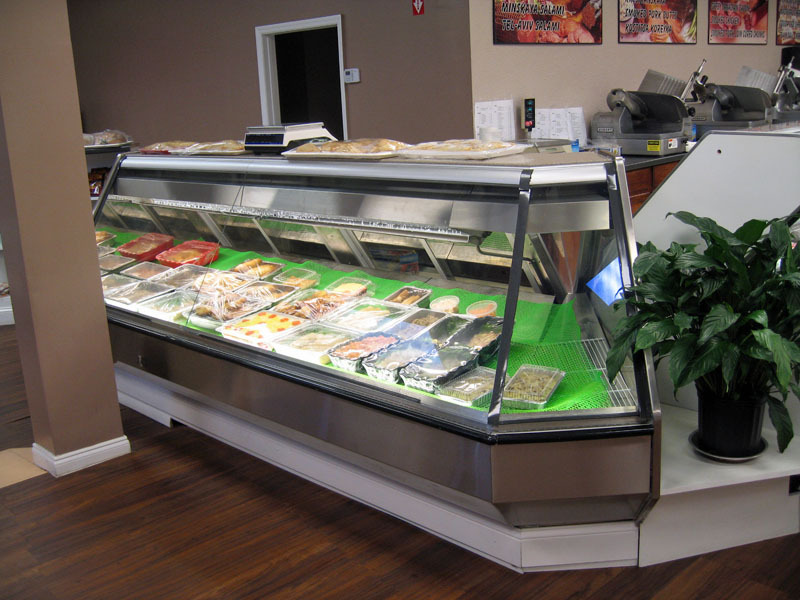 If you are looking for an extensive selection of very fresh fruit, produce, meat, poultry, and seafood items, this is the place for you. Aisle upon aisle, table upon table is piled high with all sorts of fresh vegetables and fruits. 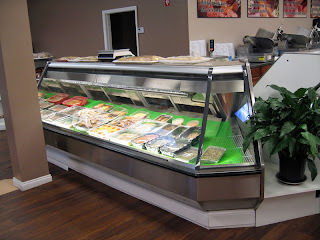 It's a huge place, and all refrigerated, and everything is very, very fresh. Lots of people were milling about, filling their carts with all manner of food, mostly fresh food. 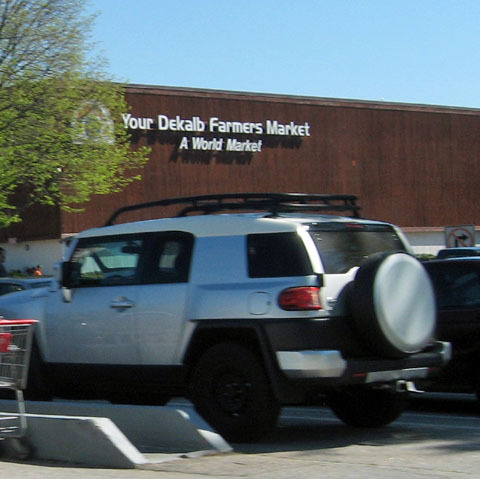 There is a smal section of cans and jars and prepackages foods, but Your Dekalb Farmer's Market specializes in fresh food--and they do it well. 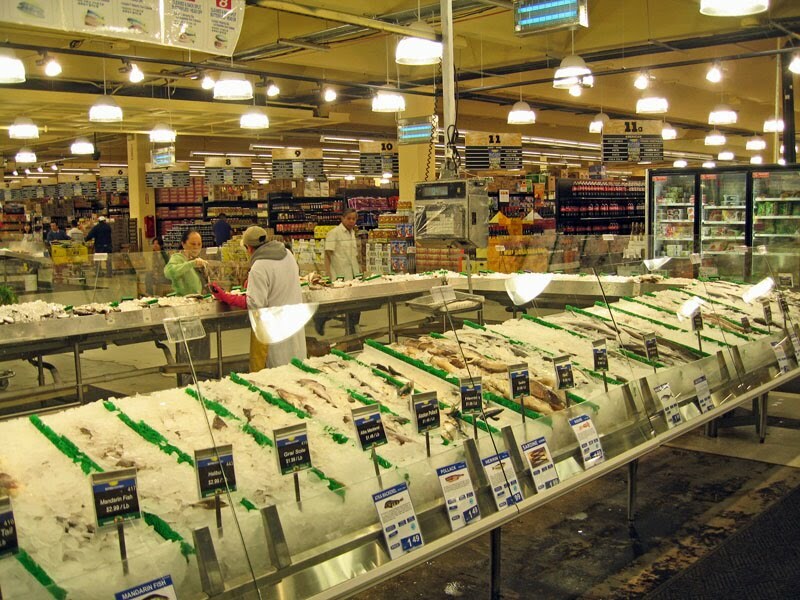 One of the features I really like here is that you can pick out your fresh seafood and have them dress it for you. Head on, guts out, head off, fileted, steaks, you name it, they'll do it for yoy--while you wait. It's impressive to watch them as they skillfully dress your fresh fish. Ice packed bin upon ice packed bin is filled with most every fresh fish you can imagine, all well labeled, all awaiting your purchase. And not just fish. Various varieties of shrimp, octopus, calamari/squid--all are here. 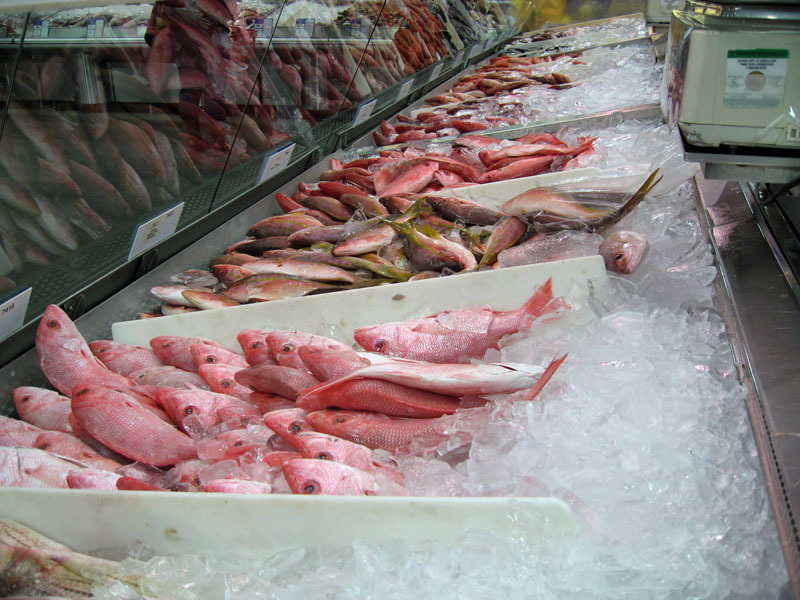 There are even some tanks full of live catfish, dungeness crabs, lobsters, and tilapia. Can't get much more fresh than that. And of course, they'll dress it for you right on the spot, however you want it. For their seafood selection, this place rocks. It's a great place and I wish we had one like this--or better yet, like Buford Highway Farmer's Market--in the Orlando area. 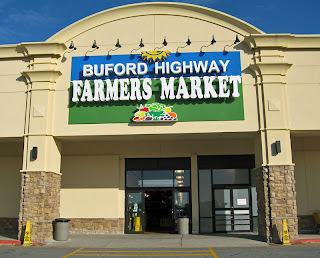 I was in Atlanta for a few days, and we kept driving past this place called Buford Highway Farmer's Market. Well, I finally decided to look it up on the web. It sure sounded like an interesting place, so my friend and I decided to stop in. There is good and bad news here: The bad news is that we don't have anything remotely like this place in Central Florida. The good news is that this is a truly awesome place. I sure wish I lived closer to it! 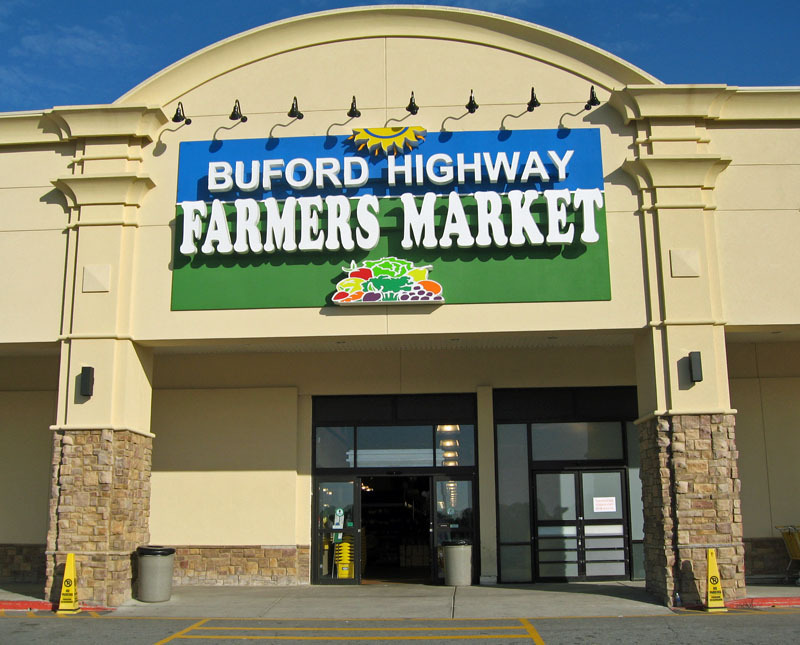 Buford Highway Farmer's Market is a large indoor specialty food store. They specialize in Asian foods and also have an Eastern European section, beside having some typical American foods, including some south American foods. 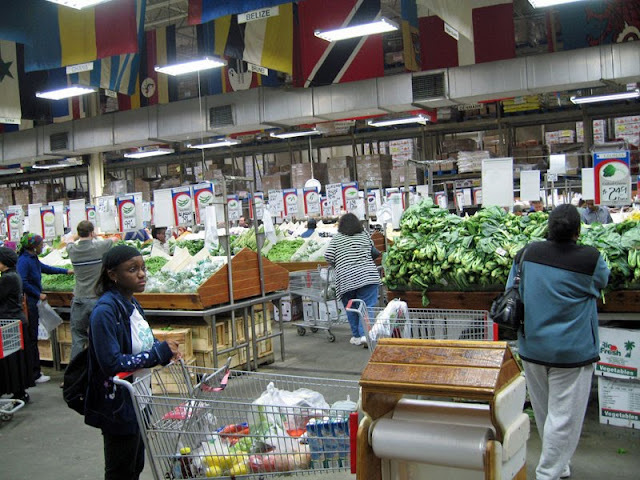 Their produce section is awesome, filled with all types of exotic fruits and vegetable. I saw fruits and vegetables here that I've only heard of, read about, or seen on Iron Chef America, but never had seen for real. Black Radishes, Dragon Fruit, Golden Beets, they have it all here. The meat section as well is awesome. Where else can you find your typical meats, but also pig's ears, cow's feet, and pigs uteri. Yes, you read that right, pigs uteri. We did look for Rocky Mountain Oysters but did not find any--perhaps they were sold out. 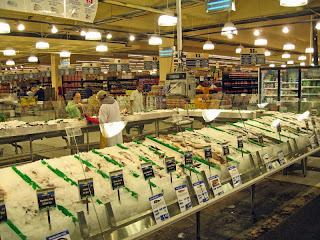 Ditto for the seafoo section, a large selection of fresh seafood on ice was all laid out, ready for purchase. Later in the day we also visited the DeKalb County Farmer's Market, and I 'd have to say that this place is better, very different, but larger and better in many aspects. Atlanta is lucky to have such a fine place, for sure. 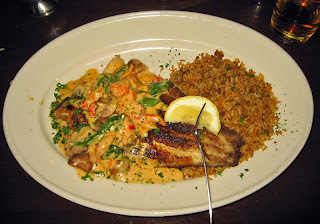 I had an excellent meal at Pappadeaux Seafood Kitchen near Atlanta recently. We arrived kind of late on a Saturday evening and found a full restaurant, a full courtyard/patio, and a 30-45 minute wait. It was worth the wait! We quickly found a table on the outside patio and got a few drinks from the bar. The waiting system is pretty simple, you get a card with a number, and then in the waiting areas they have the number being seated displayed. There was entertainment outside, some nice and mellow New Orleans style music. It was a very pleasant evening and the time passed pleasantly. Our wait actually ended up being 50 minutes. We were shown to a table in a nice quiet area, perfect for us! Our waitress was very attentive and efficient, and we never had to wait for anything. She did a wonderful job of meeting our needs. 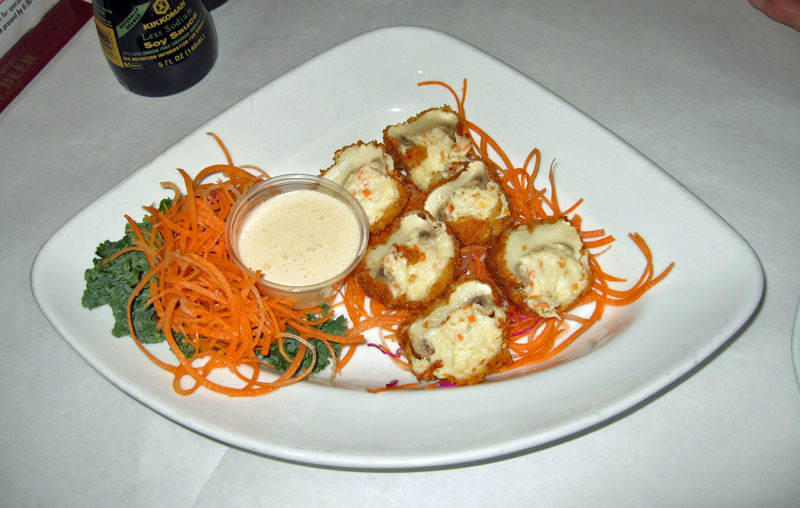 We started with an appetizer, the Boudin. 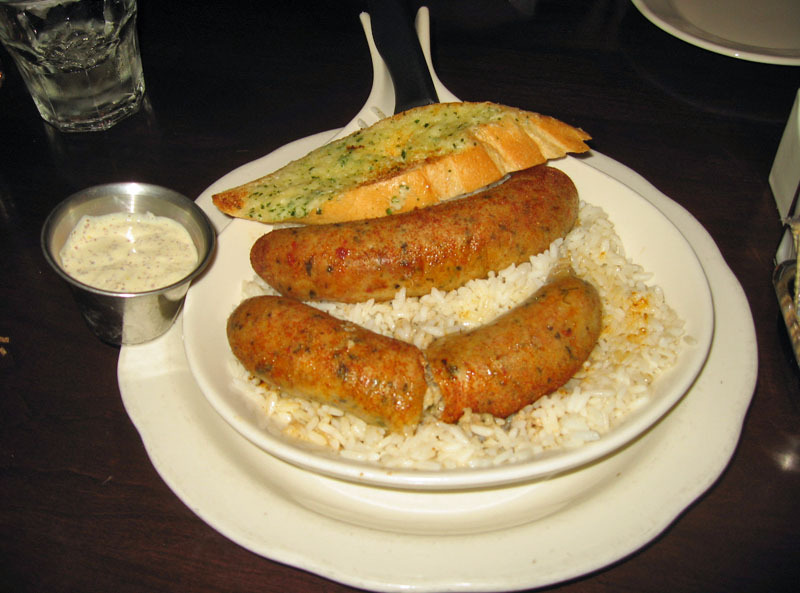 This is a cajun sausage stuffed with dirty rice. The presentation was great and the flavor was excellent. Basically this was a casing stuffed with a mixture of sausage and dirty rice. In the flavor department, this was superb. It was served with a creole mustard that was truly oustanding. 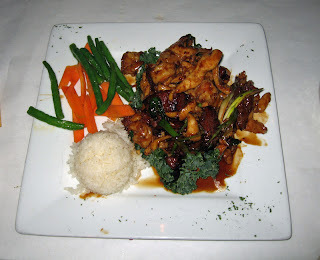 And it was served on a bed of white rice that was also well cooked and very flavorful. The one thing I did not particularly like was the casing--it was a bit chewy. But outside of that one minor point, the Boudin was excellent. I'd order it again in a heartbeat. In due time our salads arrive. I had a citrus viniagrette with mine. 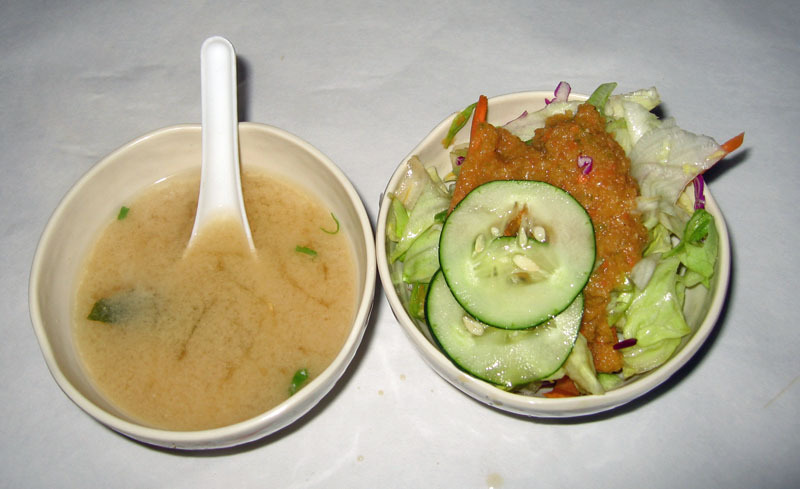 The dressing was served in a small boat but the oil was all on top of the vinegar part--it was not emulsified very well. Nonetheless, it was very flavorful. And the salad itself was very good, nice and fresh ingredients--it was really a very good salad. With the current price of tomatoes, I was amazed that there were more than just one or two pieces. In due time, or food arrived. My two friends both ordered the Fried Oysters. Both said they were excellent oysters. They also liked the regular remoulade/dipping sauce. But, they both absolutely loved the tartar sauce. It had a bit of horseradish in it. They were both impressed. For my entree, I had a special of the day: Catfish Yvette. A good-sized filet of catfish was blackened and perfectly cooked. It was placed over a portion of dirty rice and finished with shrimp, crawfish, mushrooms, and spinach in a monterey jack cheese. This dish was excellent. The catfish was cooked perfectly. The taste and texture of the dirty rice was very good. And the sauce.. oh, the sauce... it was oh, so good. Large chunks of mushroom were promiment, the shrimp and crawfish plentiful, the sauce velvety and delicious. This was an excellent dish. I'd rate our dinner at Pappadeaux as excellent in most every regard. The service was fantastic, the food great. I noticed that this place was busy the whole time we were there. It was well after 9 PM, maybe closer to 10 PM, when we left, and still they were busy with only a few open tables. Maybe al of Atlanta eats out on a Saturday night, but this is surely one very desireable place to eat. Now all we need is one of these in Lake Mary, FL. Great meal! You can get Good Eats at Atlanta's Colonnade restaurant, and i did when I visited recently. I was visiting Atlanta with a friend and we met up with several of his friends for dinner on a Friday night here. There was a wait, a good 30 minute wait, but it was well worth it. We sat outside on the patio and had a few drinks while we were waiting, it was a pleasant spring evening in Atlanta. Eventually we were seated and had a chance to peruse the menu. It has lots of good ole southern favorites on it, for sure. Eventually I settled on the Low Country Shrimp and Grits with black-eye peas for a go-with. I also ordered a salad for a starter. The others in my party got their salads first. Eventually we flagged our waitress down and then she got my salad as well. I guess she was a bit new but was apologetic and otherwise our service was good. 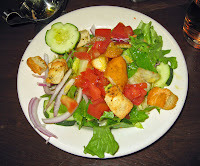 My side salad was pretty good and I had it with a homemade balsamic vinegar dressing--that was very good as well. A salad always hits the spot with me! In due time my Low Country Shrimp and Grits arrived. Twelve fair sized shrimp sat atop a mixture of okra and tomatoes that sat on top of some cream grits. Each element of the dish was pretty good. 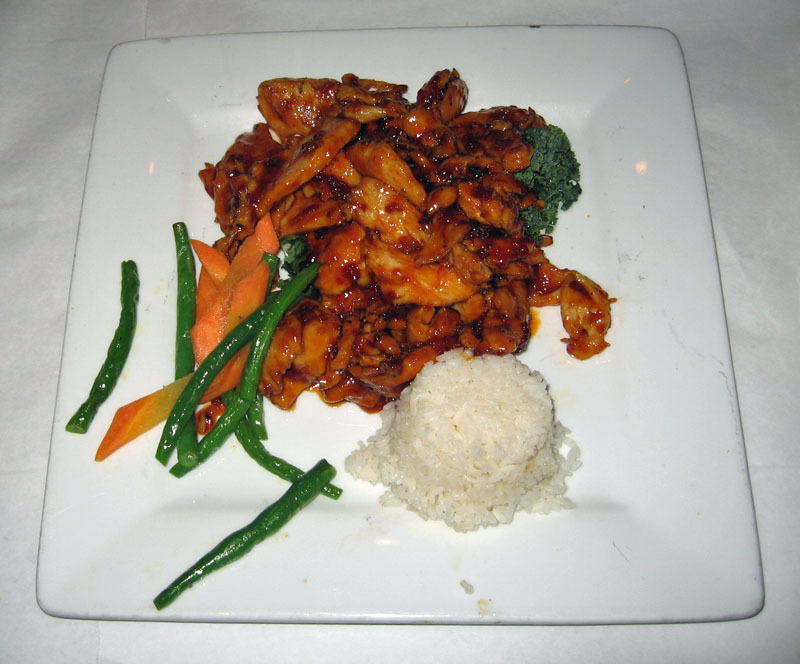 The shrimp could have been cooked just a bit less, but they were not grossly overcooked. The okra was done perfectly and not at all slimy. The tomatoes were plentiful and flavorful, and the grits were nice and creamy and not at all gritty. Nicely done. I did feel a bit that the dish was four separate elements, however. They all went together well, but did not seem to be tied together really well like with a sauce or some other element. Still, it was a good dish and I enjoyed it a lot. My go-with was a side of black-eye peas. I guess I was expecting something more. They were OK, a bit on the ordinary side, and lacking in a bit of salt--they could have been seasoned better. But they also needed something to make them pop, and they did not have that. They weren't bad, they were actually good. It's just that they were not spectacular. Oh well. Overall, we had a very nice dinner here. It was a lot of fun and my friends all enjoyed their food. I had a taste of the trout one friend had, and it was very good. I also had a fried chicken liver--I did not think I'd like it at all, but actually, it was very good! Our waitress did apologize for the forgotten salad and as a result took my drink off the bill, that was very nice. Overall, our service was pretty good and we had a great time. Ri Ra Irish Pub rocks! A friend and I went here for drinks after work recently, and I was very impressed. Most of the interior woodwork, floors, and decorations have been imported directly from Ireland--it really has to be seen to be believe. Very ornate and very old, the furninshing and all deocorations are astounding. It's an Irish pub and they have a nice selection of Irish (and other) beers on tap, plus an extensive list of bottle beers from all over. A beer lover would have no problem finding something great to drink here. We decided on an appetizer, the Hand Cut Chips--french fries that were totally awesome. Hand cut, fried, and served with a great dipping sauce of mayo, malt vinegar, and worcestershire--they were wonderful. Ok, the drinks here were pretty darned good too. And the drinks plus the atmosphere plus the appetizers added up to a really good time. I sure wished I lived in Atlanta and close to this place, as I'd probably become a regular here. But if you're in the area, you need to try this place out. And again. And again! Oh, and if you were wondering....yes, the chocolate martini in the background is definitely awesome! Try it! I had lunch at Gordon Biersch Brewery the other day with some work friends. It was a good choice. One of my friends had a coupon for an appetizer, so I got to sample the Southwestern Eggroll....it was very good. It was an egg roll filled with pulled chicken, black beans, corn, roasted red peppers, and pepper jack cheese, and served with a ranch dipping sauce. The four pieces, once split, did not last long--they were excellent. For my lunch i ordered the Marzen Barbecue Chicken Sandwich--grilled chicken with barbecue sauce, smoked bacon, cheddar cheese, barbecue sauce, and garlic fries. First off, the garlic fries were awesome! Nice, handcut fries were expertly fried and had lots of garlic on them....Yumm. The sandwich itself was a bit messy from the barbecue sauce, but had a nice flavor. With the tomato and lettuce for "cruch," it was a very good sandwich. I also had a house salad to go with. I was thinking salad=healthy, but with the cheese and bacon bits, I'm not sure how healthy it was. However, it was still a very good salad. Overall, we had a very good meal here. I'd like to return some day after work and try out the beers from this micro-brewery--they looked good as well! Village Corner is a very nice, authentic German restaurant set in the shadow of Stone Mountain, GA. I was fortunate to eat lunch here recently with a groub of friends. Our group of 10 arrive here around 1:30 on an overcast afternoon and were promptly seated in a private room, a nice setting for the ten of us. Our drink orders were promptly taken and questions about the menu quickly answered. Eventually, we all ordered. For an appetizer, we had a giant pretzel with mustard. Giant is the word for it. The pretzel was very good, and the mustard served with it was excellent. We had a variety of lunches but I'll concentrate on mine, mostly. But first, I have to make mention of the Sausage platter for two that two of our group ordered. Oh my god, what a feast--and certainly more food than two could eat. Bratwurst, sausages, potatoes, sauerkraut, and mustard, this was a huge platter of food that was very good. This was indeed a feast! I ordered the Jaeger Schnitzel. I've had Jaeger Schintzel before at other places, and this was as good as any I've had. The schnitzel was tender and juicy, and covered with a mushroom gravy. OK, time for my only complaint: the mushroom gravy had a bit of a gray color to it, not the normal rich brown that I'd expect. The taste was spot-on, just the color was a bit off. It was served with wonderful spaetzle, and with red cabbage that was excellent--tender, a bit tangy, and very flavorful. This was a very good meal and I ate every single bit of it. We had a very nice meal here, and I'd certainly recommend Village Corner German Restaurant to anyone in the area. Give it a try, it's great German food!